How do tonsils and adenoids affect sleep? What is the difference between snoring, sleep disordered breathing and obstructive sleep apnea? What is the difference between a sore throat and tonsillitis? What can be done about recurrent sore throats? What does it mean if my child is feeling better, but the strep test is still positive? What are the benefits of tonsillectomy and adenoidectomy? What are the risks of tonsillectomy and adenoidectomy? Don't you need your tonsils and adenoids? How is tonsillectomy and adenoidectomy done? Does my child need to stay overnight in the hospital after a tonsillectomy? What can my child eat after tonsillectomy and adenoidectomy? What should I expect after tonsillectomy and adenoidectomy? The tonsils are two lumps of tissue, each about the size and shape of a large olive, in the back of the mouth on either side of the tongue. When the tonsils are small (as in young babies and in most adults) they are barely visible. Between the age of two and five, the tonsils peak in size and may be large enough to touch each other. It is normal for a young child to have large tonsils, and if they appear normal and are not causing any problem (such as sleep apnea), the size of the tonsils alone is generally not a concern. The tonsils are lymphoid tissue, that is, one of the things that the body uses to fight infections. But they only represent a small portion of the body's defense systems; lymphoid tissue is present all along the lining of the nose, mouth and throat (as well as elsewhere throughout the body). The tonsils are just two lumps of this tissue that happen to stick out enough to be seen in the back of the mouth. The "adenoid" is the name given to a third lump of lymphoid tissue that sits between the tonsils, above the palate (the roof of the mouth), in the back of the nose. This tissue cannot be seen without special instruments or x-rays, since it is hidden from view by the palate. It is located in an area called the nasopharynx, and if it is large enough, it can block air from flowing through the nose. The easiest way to understand the adenoid is just to think of it as a third tonsil. Just as with tonsils, it is normal for a young child have large adenoids, and the simple fact that the adenoid pad is large is not a reason for surgery. Babies are born without visible tonsils and adenoids. The adenoids begin to grow in the first year of life, peak in size between age one and five, then slowly get smaller as a child grows. While the occasional teenager may still have adenoids big enough to cause blockage of the nose, this is rare and the adenoids typically shrink away before adolescence. The path that air takes from the nose through the throat down into the lungs is called the airway. The tonsils and adenoids form a ring of tissue in the back of the throat. If the tonsils and adenoids are large, they narrow the airway and reduce the flow of air into and out of the lungs. Even if the tonsils and adenoids are very large, they generally do not cause significant breathing difficulties while a child is awake. They may cause lesser symptoms such as a continuous stuffy nose, "nasal" speech, drooling or a habit of keeping the mouth open, but these alone are rarely reasons for surgery. During sleep, however, the muscles of the throat relax. Air flowing through the narrowed space results in a drop in air pressure. The combination of relaxed muscles and low pressure causes collapse of the throat and the child will be temporarily unable to breathe (apnea). After a few seconds of struggling, the child is partially awoken from sleep by the apnea, although he or she will usually not completely wake up. The muscle tone then returns, and the throat opens- often with a gasp. A child may go through many of these cycles in an hour, resulting in a disturbance of the normal sleep patterns. This condition is known as Obstructive Sleep Apnea (OSA). Sleep disordered breathing (SDB) is a general term, referring to any kind of disturbance of breathing that happens during sleep. Obstructive sleep apnea (OSA) is a severe form of SDB, in which breathing completely stops until the patient wakes up enough to open the airway and start breathing again. Usually, the patient does not wake up completely, but rather just goes to a lighter phase of sleep. Snoring is another form of SDB. It is the noise of vibration in the soft tissue that lines the throat. This happens when the flow of air is disrupted, such as when the tonsils or adenoids are large. Adults who snore often are overweight, or have nasal problems (such as a deviated septum) leading to obstruction. Some patients who snore have sleep apnea, and most patients with sleep apnea snore. However, snoring alone (without OSA) in children does not require any treatment at all - it will usually resolve as the tonsils and adenoids naturally shrink with age. When it is severe, OSA can result in serious conditions such as heart strain, abnormalities in heart rhythm, and changes in the blood flow to the lungs. These problems are very rare in children, unless they are obese. More common complications of OSA in children include poor growth, behavioral problems, concentration difficulties, bedwetting, or daytime sleepiness (since the sleep that they are getting is not as restful as it could be). Sleep disturbance can also occur even without complete apnea, if the child is struggling to breathe against resistance and airflow is reduced. Most children with sleep disordered breathing have enlarged tonsils and adenoids, and removing this tissue results in a cure of OSA in more than 90% of patients. Snoring may persist after surgery, but if there is no more apnea, the snoring itself does not require any treatment. In some cases, however, there are other causes of SDB which will result in persistent OSA after surgery. These include obesity, a small jaw, a big tongue, a variety of congential skull abnormalities, or neurological problems causing poor muscle tone. It is helpful to think of SDB as more of a sleep problem than a breathing problem. That is to say, for most otherwise healthy children, the main risk of SDB is that a child will not get a good night's sleep, and that this may affect daytime behavior and performance. The brain is always working, and will awaken a child to shallower levels of sleep before the oxygen level in the blood gets too low. Unfortunately, this continual partial awakening fragments the normal sleep rhythms and causes inefficient, insufficient sleep. What is the difference between a sore throat, "strep throat" and tonsillitis? A sore throat can be caused by a number of problems, but is usually the result of a virus infecting the upper respiratory tract (the mouth, nose and throat). Less commonly, it can be caused by a bacterial infection. "Strep throat" is an infection by one particular type of bacteria- Streptococcus pyogenes. Although other bacteria can cause throat infections, most doctors will try to specifically diagnose the "strep" bacteria so that antibiotic treatment can be given. This is to help the symptoms resolve more quickly, and because in rare cases, these infections can result in damage to the heart or kidneys. If the tonsils are infected with a bacteria, they will usually get large, turn somewhat red, and may have some yellowish-white debris on the surface. This would be called bacterial tonsillitis, which is one kind of sore throat. 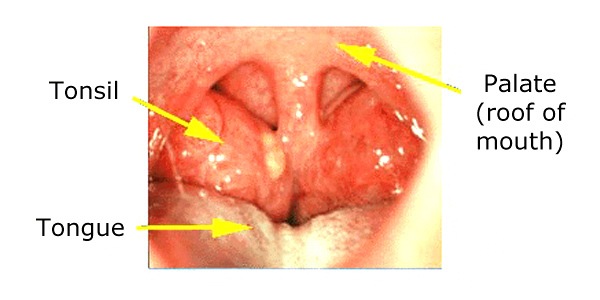 Appearances can be misleading, since there are some viruses which can make the tonsils look like this or worse. Teenagers with infectious mononucleosis (a condition usually caused by infection with the Epstein-Barr virus) have particularly severe symptoms, with very swollen tonsils covered with debris, yet antibiotics are not needed for this disease. On the other hand, the "strep" bacteria can be present in a normal looking throat. The only way to be sure is to do a throat culture, although there are other tests which may suggest a bacterial infection. Since most sore throats are caused by viruses which are easily spread (especially in crowded day care or school settings), it would make sense to be careful about exposing a child to others who are sick. Bacterial throat infections can be treated with antibiotics, but there is no benefit to treating a virus with these drugs. As with recurrent ear infections, some doctors try to prevent sore throats with a low dose of a mild antibiotic for a prolonged time (weeks to months). There is concern, however, about the overuse of antibiotics. This practice can result in the germs developing a resistance to the drugs, as well as in side effects in children such as allergic reactions. Therefore, I prefer not to use this approach. If a child is very severely affected with recurrent sore throats, particularly if they involve tonsillitis, a doctor may recommend removing the tonsils and adenoids (also known as tonsillectomy and adenoidectomy, adenotonsillectomy or T&A). This is the removal of the tonsils and adenoids (which generally get infected along with the tonsils). Recurrent infection is a less common reason for surgery today; T&A is more frequently done for sleep disordered breathing. There is a condition known as the "carrier state", in which the child is feeling fine, but a throat culture still shows the presence of the streptococcal bacteria. While this is somewhat controversial, most pediatricians do not treat children who are carriers with antibiotics except in unusual circumstances. They do not seem to be at very high risk for developing heart or kidney damage, and are generally not considered to be contagious. In the case of an otherwise normal child with enlarged tonsils and adenoids, the cure rate of sleep disordered breathing is greater than 90%. While this usually is obvious immediately after surgery, some children will not show the full benefit of improved airflow until several days have passed and the swelling has gone down. In the case of a child with recurrent tonsillitis, removing the tonsils and adenoids will result in fewer episodes of sore throat. However, the operation can not prevent anyone from getting a cold or other virus, and occasional illnesses with throat pain may still occur. There are a few unusual reasons for T&A apart from sleeping problems and recurrent infections. Children who have an abscess (a collection of pus) around the tonsil may require surgery to drain the infection. A tonsillectomy is usually not done at that time, since bleeding is more likely if the tonsils are removed during an infection. These children may be referred for a T&A in 6 weeks or so after the inflammation has resolved. Even more infrequently, a child with one tonsil that is growing much larger than the other will be referred for surgery. The tonsil is removed to make sure that it does not contain a tumor or other growth. The surgery is done under general anesthesia, and this is usually the most frightening part of the whole process, for children and for parents. Modern pediatric anesthesia is extremely safe. It is given by a trained professional in a well monitored setting. Usually, this will be an anesthesiologist specializing in the care of children. There will be time before the surgery for parents to speak with the anesthesiologist and ask specific questions. Lesser degrees of anesthesia (such as sedation) may actually be more dangerous than general anesthesia in a healthy child, and are inappropriate for surgery in the throat. Even though children may become frightened during the administration of the anesthetic, after the operation they usually do not remember anything about the time just before they went to sleep. The most common risk of tonsillectomy is bleeding after surgery. It usually takes about two weeks for the throat to heal completely, and bleeding can be seen at any time before then. However, when bleeding does happen, it is usually about five to ten days after the operation when the "scab" over the place where the tonsils used to be (the tonsil bed) breaks up and separates from the wall of the throat. Bleeding that is enough to be noticed happens in about 2-4% of patients, and will be seen as blood in the mouth. Significant bleeding after adenoidectomy alone is extremely rare. Postoperative bleeding from the tonsillectomy site often stops by itself. However, I always recommend that any bleeding child be brought to the emergency room for evaluation just to be safe. If the bleeding persists, it is usually managed in small children by returning them to the operating room for a brief procedure under anesthesia, in which the open blood vessel is found and cauterized. Some adolescents and adults may allow this to be done without anesthesia, but most children will not permit a thorough examination and cautery while awake. The soft palate (the roof of the mouth) keeps air from flowing backwards from the mouth to the nose during speech and swallowing. After removal of the adenoids, there is a much larger space in the back of the throat connecting the mouth to the nose, and it may take several weeks for the palate to adequately make the same seal in this region as it did before surgery. Most patients therefore have a high, whiny, "nasal" voice after surgery, different from the "clogged up" sound that they had before the operation. Usually, this does not last long, but sometimes it takes a few weeks or even months before the palate can stretch enough to make a good seal again. In rare patients (usually those with underlying palate abnormalities), this voice problem may persist, requring special therapy or even further surgery. Occasionally, a child will have pain after surgery that is so severe that he or she will not be able to drink enough liquid and will become dehydrated. If this happens, the child may need to be readmitted to the hospital overnight for stronger pain medication and intravenous fluids. Other risks such as excessive bleeding during surgery, scarring of the throat and infection are extremely rare. This has been a concern over much of the 20th century, especially when tonsillectomy was done more commonly. Since the tonsils are immune tissue, it would seem logical to think that removing them would somehow reduce the body's ability to fight infection and tumors. However, many studies have been done over the years to look at rates of lymphoma, polio, and other infections with and without tonsils. There have not been any consistent findings of decreased immune function or increased rates of disease following T&A. It seems that the tonsils and adenoids are the "tip of the iceberg" with regard to the immune system, and that removing them does not significantly harm the immune function of the body; there is a lot of this type of lymphoid tissue elsewhere in the body. Tonsils and adenoids are often referred to as a single body part, since they are generally managed together. As we discussed above, the tonsils are two lumps of tissue on either side of the tongue, and the adenoids are a third lump between the tonsils, but sitting higher in the back of the throat, behind the roof of the mouth where they can't be easily seen. If you think about the tonsils and adenoids in three dimensions, they are like an arch or ring of tissue in the back of the throat. So whether surgery is being considered for breathing problems at night, or for recurrent infections, the tonsils and adenoids are not considered separately, as they are both involved with each of these problems. Sometimes a very young child will have the adenoids removed for nasal obstruction, but not the tonsils, if they have not yet begun to enlarge. Other times, in a teenager or young adult, just the tonsils will be removed because the adenoids have already shrunken away with growth. But usually, they are removed at the same time. Tonsillectomy and adenoidectomy is done through the mouth, and there are no cuts or sutures anywhere on the skin. The tonsils may be removed with a knife and scissors, with an electric cautery, or with one of several new devices which cut tissue with less heat and damage to the surrounding area. While a few surgeons use a laser, I do not feel that the additional risk of using this device is balanced by any major decrease in pain or bleeding after surgery. The tonsils are visible when the mouth is opened, and are removed while looking directly at them. They are also encapsulated, which means that they can be removed from their beds in the wall of the throat as one piece of tissue. The adenoids, on the other hand, are not visible directly and must be seen with a mirror placed in the back of the throat. They are not encapsulated, so they are always "shaved" down with a curette or powered shaving instrument, and come out in pieces. Enough tissue is taken to unblock the back of the nose, but there is always a small amount of adenoid tissue left at the end of the surgery. Any attempt to remove all of the adenoids would not only be unsuccessful, but would risk damage to nearby structures and severe scarring of the back of the throat. It is extremely rare for the little bit of adenoid tissue left after surgery to grow back enough to cause problems. I use one of two techniques for removing tonsils, depending on the reason for the operation. In cases of recurrent infection, I almost always use a device known as a Coblator®. This is a surgical tool that uses an electric current to create a very small energy field which disrupts tissue bonds. The result is that the tonsil can be dissected from its bed with very little bleeding and minimal heat damage to the surrounding tissue. This results in a less painful recovery compared to other methods of completely removing the tonsil. For patients having surgery for breathing problems at night, another option is the intracapsular (or "partial") tonsillectomy. With this approach, the tonsils are shaved down, like the adenoids described above. A small amount of tonsil tissue is left behind and cauterized with an electric current. The advantage of this operation is that healing may be less painful than the operation where the tonsils are removed completely. There is also some evidence that bleeding may be less likely during the healing process. However, every child is different, and many have similar difficulties with the partial operation as are seen with the standard tonsil removal. One tradeoff is that in some cases, the small amount of tonsil tissue left behind may enlarge again, possibly causing recurrent symptoms. For this reason, I do not do the partial tonsillectomy in cases of recurrent infections. It is important to understand that the reason for leaving a small amount of tonsil tissue behind in the partial tonsillectomy is not because that little bit of tonsil tissue is serving a needed purpose for the immune system. You have a lot of this tissue all around the throat, so even when the tonsils are completely removed there is no additional risk of infections. The reason for leaving it behind is to help make the recovery more comfortable. Each patient is different, so I always discuss all reasonable options with patients and their parents before deciding on the best approach in any given situation. However, in recent years I have been using the partial operation less and less frequently, given the good and reliable results of the standard tonsil removal surgery. In the past, all children undergoing this surgery stayed overnight for observation. Most managed care plans and other third party payers today will not allow this expense unless there is an exceptional reason for admission (such as severe obstructive sleep apnea, age less than 3 years old, or underlying medical problems). In fact, this should not reduce the safety of the operation, since the most common complication (bleeding) does not usually occur until at least five days after surgery. If a child is breathing, sleeping, and drinking well after a few hours in the recovery room, they are generally safe to go home. Certainly, any child may be admitted to the hospital from the recovery room if- in the surgeon's opinion- there is any problem requiring observation. In the past, many surgeons followed strict dietary guidelines after surgery. Liquids only were allowed, and milk or citrus juices were prohibited. While this is an individual practice preference, I do not advise any restrictions except to avoid "sharp" foods for the first two weeks (such as pretzels or chips, which might cause bleeding). Immediately after anesthesia, the child may feel some nausea, and rich foods like milk or cheese may cause vomiting. However, this feeling usually goes away after a few hours. Ice cream is an ideal food, since it is cold (which reduces throat pain), liquid (which prevents dehydration) and rich in calories (which is important since a child may not be eating too well after the operation). Tonsillectomy and adenoidectomy can be a fairly painful procedure, and a bad sore throat may linger until healing is complete in about two weeks. Some children, particularly young children, bounce back fairly quickly, but older children, adolescents and adults usually have a more difficult time. The pain seems to peak after a few days, and then gradually subsides. Patients also may have a bad taste in their mouths and bad breath as the scab breaks up and falls off. Ear pain is very common, since the same nerves bring sensation to the throat and the ears. This does not mean that an ear infection is present. Antibiotics are not necessary, but pain control is important. One good option is acetaminophen (Tylenol®). Codeine can be added to Tylenol, but research does not show that this improves the pain relief significantly. More important, recent studies have shown that a small percentage of children (for genetic reasons) are prone to metabolizing codeine extremely quickly, resulting in the risk of serious side effects. These can even be life-threatening in very rare cases. While it may be possible in the future to screen for this gene, at present this is not done routinely, especially since codeine doesn’t improve pain control very much. The FDA actually now prohibits the use of Tylenol with codeine in this setting. Aspirin should not be used as it can interfere with clotting and contribute to bleeding. In the past other “NSAID” drugs like ibuprofen (Motrin® or Advil®) were also avoided because of concerns about bleeding, but recent research has shown that they are safe and effective for pain relief after tonsil surgery. Currently I recommend Tylenol or ibuprofen every six hours. These can also be combined, alternating Tylenol and ibuprofen so that something can be given every three hours. In some teenagers and young adults, I occasionally recommend pain relievers containing narcotics, but these need to be used carefully, and should not given to patients who are groggy or sleepy. Patients may swallow some blood during surgery, and it is not unusual to see a small amount of old, dark red blood after vomiting on the first day. However, any active bleeding (with bright red blood) is abnormal and the child should be immediately taken to the emergency room for evaluation. Even if the bleeding has stopped by the time the child is in the hospital, some doctors may wish to admit the patient for overnight observation. For this reason it is very important not to travel far from emergency medical care in the first two weeks- no more than 30 minutes from the nearest hospital. Activities such as air travel, camping and hiking are not allowed during this time. School does not need to be restricted, and a child can return to class as soon as he or she is feeling well enough to go back (usually a day or two). If a child is not drinking enough after surgery, they may become dehydrated. As long as they are taking in enough fluids, eating is less of a concern in the first week after surgery. Calories can be supplemented by giving liquids such as milk shakes. A dehydrated child may feel excessively tired or dizzy, have a dry mouth, and urinate less often. If this is the case, they should be seen by their pediatrician or surgeon, who may recommend admission to the hospital for intravenous fluid therapy.